Here’s what continually amazes me about my pile: Over the past eight months I’ve added to the original, virgin mass of autumn leaves a dozen or more tubs of seaweed and salt marsh hay, hundreds of pounds of soggy kitchen scraps, a dozen carton’s worth of egg shells, a bathtub full of coffee grounds, more pee than I’m willing to fess up to, reams of shredded paper, a steady supply of droppings from the back end of both horse and rabbit, and, lately, enough grass clippings and pulled weeds to fill the bed of a pickup truck. My pile has taken all that and more. And after everything I’ve thrown at it and into it, my pile still looks just like a heap of old rotting leaves. Exactly what has been going on deep inside my dark, dank heap of compost remains a mystery to me. The precise nature of my pile will soon be put to the test by the Soil Nutrient Analysis Laboratory of the University of Connecticut’s College of Agriculture & Natural Resources Cooperative Extension System’s Department of Plant Science. Though by now I figure my pile is the very definition of “random,” still I try my best to follow the instructions and extract representative tablespoons with the tip of a trowel from 10 or so spots. I take care to flick away any identifiable bits of leaves, and toss back a sea shell or two. The other two bags, my idea of control samples, are easier to get. One is filled with trowel bits gathered from a few spots along my perennial beds covered by mostly decomposed wood chips, the other with small scoops from a few spots in my raised, fenced-in vegetable garden. Why put my pile – and yard – to the test? “Soil testing is an inexpensive yet valuable tool for assessing the fertility of lawn and garden areas,” advise the ag experts from UConn. “Test results indicate the soil’s pH level, the amounts of available plant nutrients and the existence of nutrient imbalances, excesses or deficiencies. I seal the ziplocs and stuff into a small box the three samples with a check and a form, checking off the option that requests the sample to be tested for organic matter. In all, the soil test costs $7 a sample, and results are said to be prepared in 7 to 10 days. After a quick run to the post office to mail the box, I mow the lawn, depositing two hoppers worth of freshly cut grass to the side. I worry now that I am overloading my pile with these surplus grass clippings, and only after I finish mowing do I recall a trick I’ve used in years’ past: I seal off the mower’s grass catcher with duct tape so that all the grass clippings are recycled straight back into the yard. I’ll do that with the next mow, as I figure to be aerating my lawn this fall. The grass thatch and finished compost that I spread will be easily absorbed when the aerator plugs the turf with thousands upon thousands of thumb-sized holes. I haul out from the kitchen the Hooch bucket half-filled with a week’s worth of coffee grinds and vegetable peelings and a box filled with a dozen or so Dunkin Donut holes, leftovers from a local fundraiser the weekend before that I’d agreed to take home and promptly forgot about in the fridge. The kitchen scraps, including the stale donut holes, go into a trench in the middle of my pile. I carve out trenches on three sides of my pile, stuffing the voids with tossed clumps of grass clippings. I go where the pile leads me, as it’s ever-more likely to collapse into itself if I dig too steeply. My pile this year is more massive than in season’s past. I have yet to reach the very core of my pile, middle earth. But still, I am able to turn and aerate a large swath of the outer edges of it, garnishing the leaf mold with as much fresh-cut grass as I can. My pile is nearly done. From years past I know that if I wait much longer to begin adding its harvest of humus across my garden and the lawn, the surface roots of the adjacent two maple trees will infiltrate the foundation of my pile, sucking nutrients away and leaving behind a web of tangly fibrous matter I have no use for. 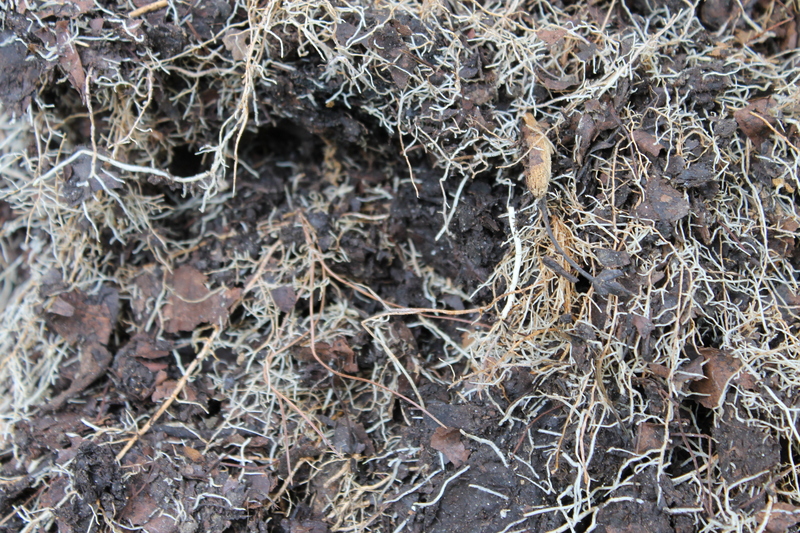 A close-up of the surface roots of the maple tree my pile sits beneath. I plug as much of the surplus grass clippings into my already stuffed pile as I can and finish by spreading more grass across the top, then covering with the scrapings of crusty leaves from the bottom edges. More than ever my pile is a tossed salad of fresh greens and old browns. With enough air and moisture it will ferment into something that is more than the sum of its parts, a small batch of new soil born of the old. After a few long work days catching up at the office, I start the weekend with a Friday evening mow of the lawn. It’s been just over a week since I last mowed, but the grass is as thick as I’ve ever seen it. It’s been a good turf-growing season so far, with well-spaced rains and no long heat waves. I have yet to hook up the rainbow sprinkler to the hose, and have put no fertilizer on the lawn other than the spreading of last season’s finished compost last fall. Even so, the grass is ankle deep and a lush dark green. And best of all, the crabgrass this year is sparse, and what sprigs I spot on my wanderings about the yard are easy to pinch out of the ground. There’s no space left for the weeds to sprout in the bare ground, so they grow suspended above the mat of grass. My experiment with creating micro meadows of clover in my lawn has paid off with an ankle-high swarm of bees. They alight on the white flower balls and sway on their slender stems while supping the sweet clover nectar. A few years ago, when the bee blight became a national story, the waxing and waning of local populations played out in my own backyard. One summer the honey bees were gone, save for a few lumbering bumble bees that nest in the rotting wood of the small lean-to shed in my vegetable garden and hover above the garden. Maybe the native bees had someplace better to go. Maybe they’ve were hijacked and trucked across country to serve as migrant labor in the almond groves of California. Maybe they were dead in their whiteboard hives and tree trunk colonies, brought down what seems like a variety of human-induced causes. I’m happy to see the bees back in force, for lately I have another backyard delight to worry about: fireflies. “Blink and you’ll miss them this summer. Around the world, people are reporting that local firefly populations are shrinking or even disappearing,” reports John R. Platt in a recent article on TakePart.com. “You can wipe fireflies out really easily,” says firefly researcher Ben Pfeiffer, founder of Firefly.org, a website about the decline of the insects, also called lightning bugs. “It’s not hard. You’ve got a one-acre plot, and you put a house there. Good-bye, fireflies. They’ll never be there again. “The loss of fireflies, which are beetles, can have multiple effects on their ecosystems. For one thing, some firefly species—there are at least 170 in the U.S.—play a role in pollination. They’re not as essential as bees, but they help pollinate milkweed, goldenrod, wild sunflowers, and other species. “The insects play a role in human health as well. Two of the enzymes fireflies use to create their bioluminescent flashes—luciferin and luciferase—are used to track the growth of cancer tumors, among other things. Fireflies have also been used to help detect bacteria in food products. “The exact extent of the decline is unknown, but early indications suggest that lightning bug populations have shrunk in many places and disappeared from others. “Everyone is reporting declines,” said Eric Lee-Mäder, codirector of the pollinator program for the Xerces Society for Invertebrate Conservation. Bees and fireflies are the winged hands that help feed us, making possible the propagation of species through what’s now seeming like a worldwide neural network that’s beginning to misfire. Like my Toro. I decide to plow through one of the tangly islands of clover to deadhead the blossom balls, now turned a dingy brown. The nitrogen rich clover will make good fodder for both my pile and when it’s grass-cycled back into the lawn. Choking on the thick wet clover, the mower seizes up, sending out blasts of white oily smoke. As I let the engine cool, I dump the groaning grass catcher at the front of my pile atop my neighbor’s regular contribution. From the looks of his gleanings and a glance across the street, I notice that his lawn has thinned out and turned a paler shade of green, having burned through its springtime fertilization. To my relief, the two-stroke engine fires back up, and I resume my snail’s pace of a walk behind the mower. I go slowly enough to flush all but the most myopic bees before my path, with the blade set high enough, I hope, to spare the fire flies preparing to take flight with the night. I skirt a micro meadow and am pleased to see it crowded with refugees bees, and leave unmowed a long stripe in the center of the lawn to create a new landing strip for the bees to alight on. Still, the grass catcher quickly fills back up, and the whirring blades spit out tufts of finely chopped clippings from underneath the chassis. Hotter weather is forecast in the days ahead, so I’ll let the sun shrivel the clippings into slivers that melt back into the turf. My backyard after a mid-summer mow. I’ve kept scattered patches of clover in the middle of the lawn. Taking pity on my Toro, I stop twice more to empty the grass catcher, in the process creating a dauntingly large heap of fresh hot greens beside my pile. Mowing at such a laborious pace gives me time to plot out the coming overhaul of my pile, a chore I relish. My pile needs a good tossing, and I could use the exercise. Plus, I have a yard’s worth of grass clippings, as well as a half-full plastic bag of shredded paper from the office, plus some past-due produce from the fridge to dispense with. I plunge into my pile by turning the wide-tined pitchfork over and using the curved tines to pierce through the back bottom wall of pressed leaves to draw and disperse the clumps a couple feet backward into a new berm. As I build this backstop of moist, dark gleanings from the bottom of my pile, I spread a thin layer of grass clippings atop the berm and along the newly exposed earthen floor. I dig further into the midst of my pile, creating a trough into which I pour the shredded paper, more grass and the Hooch bucket of kitchen slop. I cover these additions with scrapings of the dried-out leaves from across the top of the heap, then step back to watch the backside of my pile topple down upon itself. Steam rises from the newly exposed inner reaches of my pile through slanted shafts of the morning sun. It’s a rewarding sight, proof that my pile has enough oxygen for the aerobic bacteria and other micro denizens deep within it to continue to munch away. I dig deeper still, building a new backside to my pile as steep as the crumbly matrix of leaf mold and whatnot will allow, layering it as I go with the fresh-cut grass. Before long, I’ve cored out a hole that reaches nearly to the center of my pile. I step back to take a break and give me and my pile breather. Steam vapor rises from the void. In this hole goes the maple seedlings that bedevil my gardening. Nature abhors a vacuum and so do I. It’s then I get what I consider a bright idea: I’ll gather up the heap of maple seeds rotting away in the other back corner of my yard near the street and bury them in the middle of my pile. Since sweeping them off the driveway and along the street, the mass of maple whirligigs has been left to mold away next to the base of a large maple. Lately, I’ve been kicking myself for not having blown more of the winged seeds off the chipped wood mulch that rings the perimeter of my yard. Over the past month or so, hundreds of the seeds have sprouted across the mulch beds, creating a chia bed of maple seedlings that I’ll either have to pluck by hand or smother with a new supply of chips this fall. Left unchecked, they would soon throw lethal shade over the variety of young oaks that I’ve have grown from acorns tucked underneath the wood chips over the past decade. Tallamy would, quite naturally, take exception to the square footage that I devote to growing grass, though I’d like to think he’d give me a pass on the the micro-meadows I tend on behalf of the bees and fireflies. Dispatching the moldy mound of maple seeds en masse into my pile gives me a small measure of payback as well. I fill a plastic tub of the featherweight seeds and dump them into the hole in the back of my pile, then mix in a supply of grass clippings. What seeds might still be viable will soon be cooked and broken down; No doubt the seeds are packed with nutrients to be returned to my yard. I cover them by dragging the top of the pile over them and tidying up the ground along the rear edge of my pile. In a half-hour’s time, I’ve worked up a good sweat – and worked my way through nearly half my pile – and about half of the grass clippings piled along the front. So after scraping them aside, I plunge into the front, to mix and turn to the front half of my pile. Using the tip of the pitchfork tine, I tease apart what clumps of whole leaves I come across, and cover with the rest of the grass clippings. I short order I’ve reassembled my pile. It looks the same as before, only it’s reconstituted as a freshly mixed tossed salad of old browns and new greens, well on its way to becoming black gold. I step inside as the evening gives way to twilight, leaving the backyard to the fireflies that rise from the lawn to twinkle in the gloaming. My work is done for the day, and for the week. 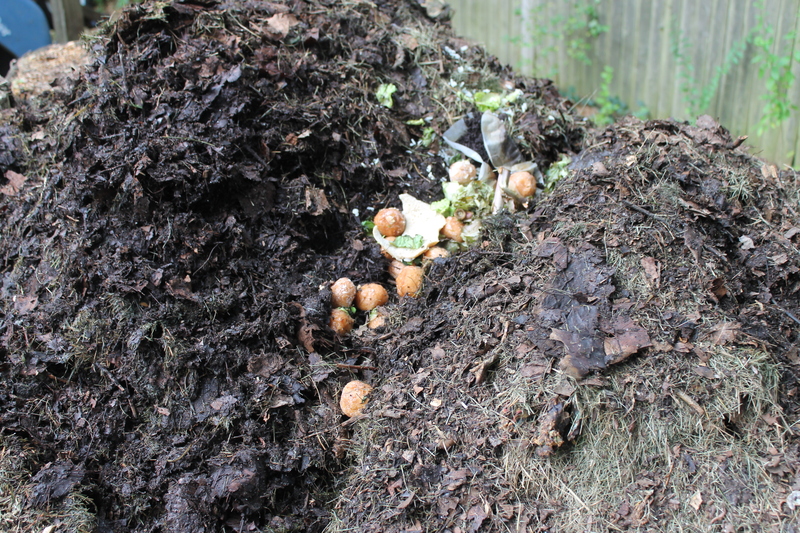 My pile has all it needs to continue doing what it does best on its own: Composting. A free Saturday afternoon gives me time to mow the lawn and plunge back into my pile. The patches of clover around the yard are now lush and quirky enough to catch the attention of my 15-year-old son, who volunteers to spot me on the mower. He carves his way through the grass, unbound by the usual boring back-and-forth striping, and proceeds to create a few new clover islands of his own. The bees have at long last shown up in some profusion among the clover flowers, and I am happy to see the summer’s first hummingbird flitting about the magenta blooms sprouting in the garden beds. With the now customary two hoppers worth of grass clippings waiting off to the side, I use a rake to skim sun-dried leaf litter from my pile’s top and flanks, scraping the dry scraps of brown to the side. I’ll use it as backfill, to mix with the week’s kitchen scraps and grass clippings. In two days I leave town for the week, and today I intend to give my pile a good airing out and mixing of old brown and new green so that it can continue to digest and foment. This is a wholesale excavation and turning of my pile, focused on the right flank, the final quadrant to be exhumed as virgin territory. Up to this point I’ve been circling around my pile, working the front and back and lately the left side, as well as the top center. My pile has become a rich mix of nearly mature compost, though the bottom right side of it remains more or less undisturbed. Not for long. First I tease out the front side of my pile, creating a berm of nearly finished compost and an open maw into which to mix the raw material laid down last fall that I will soon unearth. At this point in the life cycle of my pile, it’s as much about re-arranging the existing materials as it is incorporating new compostibles. I tear into the right side with the flat-tined pitchfork to excavate forkfuls of rich compost in the making, turning them out onto the top and flanks. I mix pockets of dry leaves with helpings of grass clippings, combining the steaming hot sections of my pile with the cool dark pockets. Before long I’ve opened up a cavity along the right side, into which I dump a bucket of kitchen scraps from the neighbor’s, full of corn husks and other summer vegetables. I top with gleanings of dry material as I go. It’s a three-step process, adding in equal measures fresh grass clippings and food scraps to mix with clutches of raw brown leaves first laid down last fall, and the in-process compost from here and there. I bury a week’s supply of food scraps deep within my pile, and mix the fresh green compostibles with old dried leaves excavated from the bottom. My neighbor wanders by to retrieve his remote thermometer sensor, but not before aiming the gun into the depths of my half-rent pile. A week after the last insertion of fermenting seaweed and grass clippings, my pile is full steam ahead. We make sport of aiming the probe into the maw. The LED display tops out at 131 degrees, and I imagine we could have easily found hotter spots within. The heat itself is not what is cooking my pile; it’s just the exhaust of the countless microorganisms thriving inside it. As they say, it’s not the heat, it’s the fecundity. At this point in its death spiral, my pile must surely rank among the most lively places on earth. 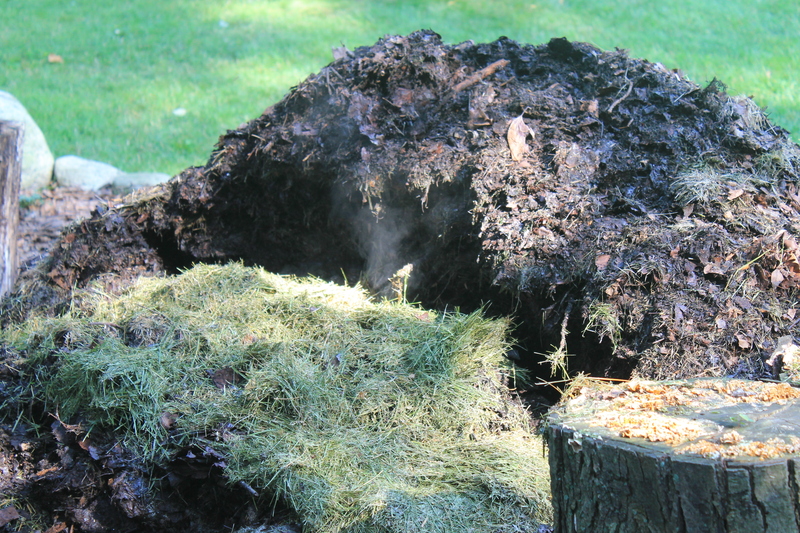 “Every compost pile is a complex eco-system of decomposition experts,” writes Julia Rymut, creator of the compostheaven.com blog. I don’t know how many teaspoons of compost are in my pile, but I imagine enough to add many zeroes to those numbers. Bacteria are not only the most abundant microorganism in soil, accounting for up to 90% of all microorganisms in compost, they also produce enzymes that further break down the complex carbohydrates – the cellulose and lignin of woody plant matter – that are slowest to rot. These enzymes continue to work even after the bacteria die off, decomposing and helping the fungi and actinomycetes finish up the hardest materials. My pile is a riot of tiny creatures, each taking advantage in its own turn of changing food, temperature, moisture and air. It’s Hunger Games, writ small. 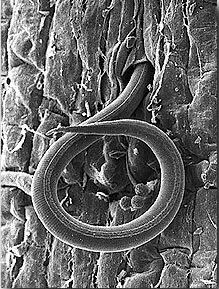 A type of tiny worm usually much smaller than a whisker, nematodes get a bad rap, in part because of their onomatopoeic name, but also because some forms are considered garden pests that attack plant roots. But many other species live nobler nematode lives eating decaying organic matter or preying on other microscopic critters, and some even as large as the dreaded turf-killing grub. My pile: It’s a jungle in there, a backyard ecosystem that is alive with truly countless living creatures, all living, loving, laboring and dying to turn a heap of leaves and organic matter into a useful (and still living) product called humus. I return home from work early this afternoon. It’s a getaway Friday, before the Fourth of July holiday weekend. I’m hoping to take a long overdue walk at the beach after work, in advance of the next night’s big fireworks display at the local beach, which each year attracts thousands of people. First, I head out to the shed to grab the plastic barrel. Though the long hot days of summer have slowed the growth of grass in my yard, they’ve also warmed the shallow waters of the nearby Sound, leaving the local beaches awash with seaweed. I know from years past that the town tidies up the beach before the fireworks by dragging a mechanical sifter across the sand. I hoped I’m too late to do some beachcombing of my own. The lawn is awash in blooms of white clover flowers, which I’m happy to leave uncut for the bees to sup upon. I don’t know how much more fresh hot “greens” my pile needs, but I like the idea of finishing off my pile as I started it – with “the best fertilizer there is” – seaweed from the beach. As Mike McGrath writes in the “Book of Compost,” “Seaweed contains trace elements, micro-nutrients and plant growth compounds you’ll never find in any chemical fertilizer – or even in most organic ones. Research performed at Clemson University found that seaweed contained at least 70 trace elements vital to plant growth – in just the tiny amounts plants like best. After my stroll along the sand I haul the barrel out to the high-water line and scoop up a load of rotting, pungent seaweed. I top off the barrel with a heaping of old seagrass stems, chopped by the surf into tangles of short, hollow straws. Once buried deep in my pile, the pixie-sticks of seagrass will also help aerate the innards and regulate the final decomposition of the compost. As I plan to use this year’s batch of humus to invigorate my lawn, I want all the nitrogen I can beg, borrow or steal. That’s one reason I’ve let the clover grow in patches across the lawn; their leguminous roots help lock up nitrogen. I can tell my grass could use more nitrogen – the patch of thick green grass below the hanging bird feeder tells me that. A winter’s worth of bird droppings has been well-received. And though my lawn could stand for mowing, I decide to wait, after seeing more bees than before hovering about the clover flowers that are springing up across the lawn. Besides, it’s more fun to walk the sea shore than the backyard behind a mower. Returning home from the beach with plenty of daylight left, I find that my across-the-street neighbor, Craig, has mowed his lawn and heaped the grass clippings at the base of my pile. I set about my evening chores to mix in the grass and the seaweed, along with a week’s worth of kitchen scraps, into my pile. Having excavated the left side of my pile a week ago, today it’s time for the flip side. As I prepare to dig into the right side of my pile, my neighbor Chylla comes by with a special request that makes the job easier. After several years of talking about creating a garden in her own yard, she has finally done it. She walks me to the side of her house, where she has dug up the ground along where the fireplace chimney, painted white, rises from the foundation. A small pile of unearthed shard of clay pots includes a set of horse shoes, crusted with rust. No doubt the play set had been set aside many years ago, and then lost to weeds and time. She has already planted free seed tidy rows of baby swiss chard and spinach, and nearby are various pots containing herbs — I see sage and rosemary — which she wants to plant in the freshly dug ground. It will make a fine kitchen and herb garden, but what it needs now is a generous helping of compost. Wheelbarrows of raw compost from my pile make a welcome addition to my neighbor’s new garden. It’s only fair: For years my pile has thrived on the voluminous scraps from her home-cooked kitchen, as well as raked leaves from her bare-swept front yard. In return, she has an open invitation to gather fresh pickings from the garden, and does so on a daily basis. But until now, aside from a few plant containers and clay pots to fill, she’s never had a place in which to share compost from my pile. And that, I have in spades. Returning to my pile, I haul out the wheelbarrow and set in front of heap and plunge into the right front corner with the manure fork, turning out cavalcades of dark, rich proto-humus. My pile is more like dirt than leaves, and as with the wheelbarrow of compost I’ve already added to my own ripening vegetable garden, I’m happy to have reason to move the near-finished compost once. I dig into the front right side of my pile, teasing out mature compost with the straight tine manure fork. The compost crumbles, and I use the spade to fill up with wheelbarrow. The only screening I do is to flick a few clumps of pressed leaves onto the top of the heap. I trundle the first load to the yard next door and spoon out compost across the new garden beds, and return twice more to leave my neighbor with her new garden beds chock-full of compost to work into the soil. The borrowings from my pile have carved out a tunnel into the right front corner, revealing the dark inner core. To gain ready access to the cliff-face of compost along the rest of the right side of my pile I turn out the log wall, twisting and teeter-tottering them to the ground. I’ve toppled the log walls that contain my pile to gain access to raw brown material — mostly leaves from last fall — on the right side. To slow walk my pile from one side to the other, I pull clumps of decaying leaf mold from the center of the pile up against the left side, creating space to heap more unearthed compost from the bottom right side, mixing in fresh scraps of grass clippings and pulled weeds. I use the short-tined pitchfork to tease out forkfuls of autumn leaves flecked with sand from the many loads of seaweed deposited last fall. 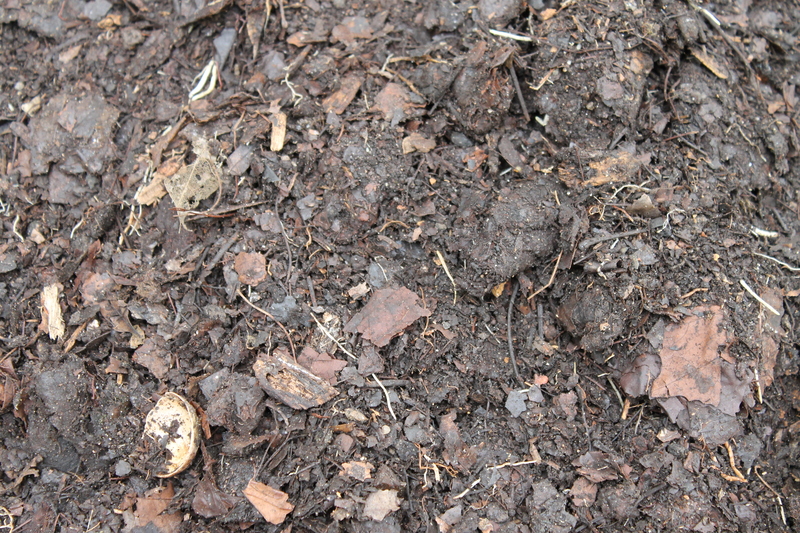 This is the cold-pressed part of my compost heap, which over the past six months has slowly decomposed under the press of leaves and mixings above it. I toss the cool, danks forkfuls of leaf litter across the growing mound on the left side of my pile, briefly exposing them to fresh air and sun for the first time since November before burying them anew under further heapings of more mature compost gleaned from the front and back sides. Much of my pile is now a rich mix of crumbly leaf mold and grass clippings. The few whole leaves that remain from last fall will soon succumb to the decay now going on at a fever pitch within the tossed sections of my pile. All this work on my pile attracts the attention of my neighbor Craig, who wanders over to watch as I tuck his grass clippings deep within my pile. He volunteers to retrieve the remote thermometer sensor he keeps in the dashboard cubby of his car. He owns a foam-installation business, and uses the pistol-shaped device to measure radiant heat. 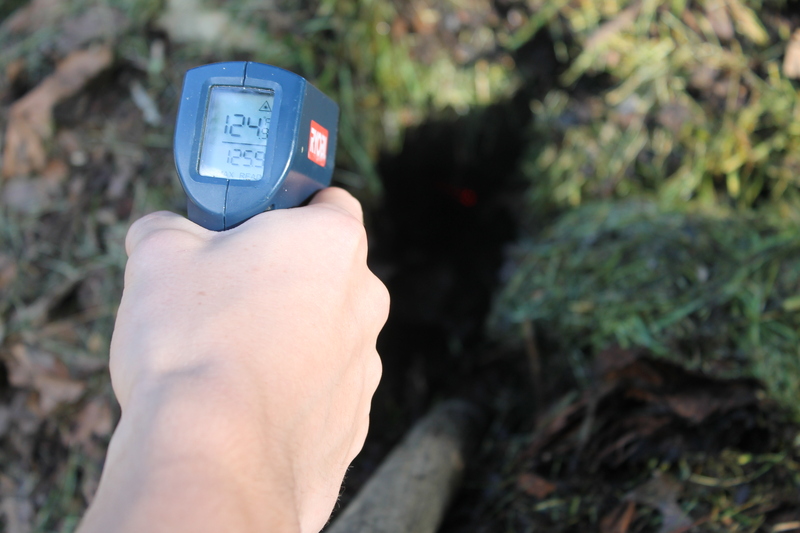 I dig out a small bore hole in the front face of my pile, and he clocks it with his temperature gun, the digital readings flicking 119, 123, 114, 124. Cool! I dig a little deeper and a 128 pops up. I fear for the safety of the earthworms but take some measure of pride in creating a hot-house of a heap. My pile is chugging along quite nicely. Here I’ve clocked it at a toasty 124 degrees. I return to my excavations, and in short order my pile is reconstituted. The left side, newly infused with a rich mixture of grass clippings, seaweed and kitchen scraps, rises tall. The right side is a shear cliff-face of dark, rich leaf mold, which has been steadily decaying since last fall, a cold press of compost, which I’ll dig into after the next time I mow. Once exposed to fresh air and mixed with grass clippings, it will go on the fast-track of disintegration, joining the rest of the heap as crumbly compost, well on the way to fruition as humus. New soil, from old life. As my pile burns through this combustible mix, soon I’ll trade in the pitchfork for a shovel, and my pile will be no more. So wrote Walt Whitman wrote in Song of Myself.